Japanese Culture: Capsule Hotel: Groupist or Individualist? Capsule Hotel: Groupist or Individualist? Capsule Hotel: Groupist or Individualist?, a photo by timtak on Flickr. The thought of Japanese salaried employees getting into the their capsules and sleeping in air-conditioned pods like larvae in a hive may give the impression of the psychology of the herd, mindless groupism. On the other hand it may be an example of social atomism (Allison, 2006), and even individualism since, in a Western country, this scene -- like that of the ubiquitous Japanese student accommodation, "one room mansions" -- might be replaced by a that of a more friendly, communal dorm. 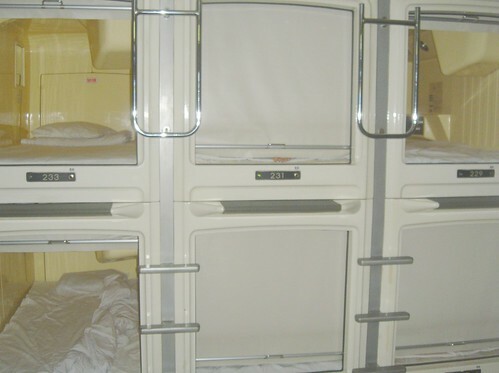 Or the capsule hotel may be an example of social estrangement and collectivism since, like the prevalence of social withdrawal (hikikomori) and social phobia (taijinkyoufusho), it may be the result of as a result of greater social dependence (amae: See Doi, 2002), a concomitant inability to leave immediate family, (Kato et al., 2012) and as therefore demonstrating the lack of a developed, independent self. My own feeling is that neither categorisation is particularly useful and that each are mutually dependent - the self is social - (Markus & Kitayama, 1991) but that Westerners tend to use this dichotomy due to the influence of Christianity, the main text of which is a series of vignettes where the hero ignores social and follows his conscience. The possibility that "conscience" is also social is generally refuted or ignored. Allison, A. (2006). New-Age Fetishes, Monsters, and Friends: Pokêmon Capitalism at the Millennium. Ed. Tomiko Yoda and Harry D. Harootunian. Japan after Japan: Social and Cultural Life from the Recessionary 1990s to the Present. Durham & London: Duke UP, 331–57.